Let me try again =] My name is Melissa, I've been pin collecting for 2 years on and off. Oooo I just discovered this thread, what great fun!! Hi everyone! Thank you Sir docfish2u for such a generous idea! I'm not new to the forums but I HAVE been recently active! Some of you may have seen the thread about Japan pins already and I'm excited to share Disney love from Japan! I collect Donald Duck and Jack Skellington pins, along with the occasional couple pins of Donald & Daisy and Jack & Sally respectively. My pinpics account is the same as my username: calie. Pleased to meet you all and to be a part of this community! Im quite new to the forum and therefore new to zapping! :- ) I collect The Lion King (favourites include pins of the I Just Can't Wait To Be King scene and also of Mufasa, but I love TLK in general wholly and completely), and also pins of Djali from Hunchback of Notre Dame. And I have to admit I already love white Baymax from Big Hero 6 so I have no doubts he will somehow develop into a collection. I have added all of you and Melissa this is perfect now!!! Welcome to all of you and I hope you get zapped very soon!!! Welcome!!! Have you set up a pinpics account yet? If so please let us know what it is so it is easier to get you zapped. These beauties arrived this morning from super duper awesome halloweenfiend! Thanks again. Hi new here so obviously never been zapped . My collection so far only consists of the nerds rock (heads), the ones I received on my honeymoon. I do have a pinpics account which is MzMarie as well. My fave characters include the "main mouse" Mickey, Tiana, Marie (aristocats) and marvel characters. Very nice idea! i have not been zapped. My name is Dennis Verdaasdonk, my fav characters are: Stitch/Roger Rabbit and my pinpics is dennis_dennis. I live in the netherlands! First welcome to DPF!!! I am happy to add you to the list. I hope you get zapped very soon! Not zapped! But a great gesture as I know some of my close friends who have. Thanks for the consideration. Be sure to read the opening post and follow all of the directions. Sorry bout that. Difficult to do from my phone. I collect beloved tales pins, snow white (for my girlfriend who just started collecting), and DSF marquee pins. My pinpics is "kaleomana". Thank you again for the consideration of the DPF family. Yes getting zapped by anybody counts and yes they did a fantastic job of it!!! Not only am I new to the Forum I am also new to pins only having discovered them during a trip to WDW with my family I took a little over a week ago. I quickly became obsessed and have started to build my collection from a variety of sources. I often can be found reloading the FOR SALE forum to see if there is anything new that has been added that I can buy that would fit my very small but growing collection! 6. Whatever else I think is just plain fun! Hahahaha do I sound like a newby or what?! Anyway, I am happy to be part of this forum and look forward to learning from everyone. Okay so it has been far to long since I have updated this thread. So if you are on the list then please post here and who zapped you so I can update that list. If you are not on the list yet and have never been zapped let us know. With all of the zapping going on lately it is a great time to update this!!! Well the doc himself zapped me! Yay, 3 more down as I also got Magpie812 with the 12 zaps. I am going to go through the remaining people and check to be sure they have been online in the past few months. If you have been mia then I won't have an updated address. I would hate for somebody to send something to the wrong address. If you are new here you are welcome to sign up. If you have been here for a while and have never been zapped please sign up. Don't forget to follow to send your address. We can't get you zapped if we don't know where you are. 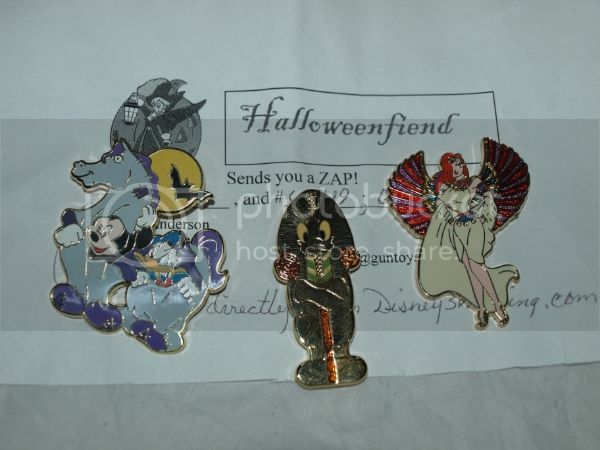 Please also send your address to Judy (tiggermickey) as she also has a large address list. That way if one of us is not around for some reason the other one can help out with addresses. Might be a good time to remind people that we only give out addresses of people that have said it is okay. If you have signed up for one of my give away games and don't want your address given out I make a note in my address book and your address is never given out. We do not under any circumstances sell your addresses. They are for zapping purposes only here at DPF. It is not as important what you zap, just that you zap!!! Hi - I've zapped but have not been zapped yet. So glad he got there safely and you like him! You are most welcome! Happy New Year! I havnt been zapped yet, my pinpics is blkviper my favorite characters are. Elsa (of course) Nala simba lady and tramp. Do I have to pm u my address now or later?